Gun handling with dirty, injured or gloved hands is no easy task. A cold, wet and dirty gloved hand makes gun handling and defensive shooting difficult. The wise defensive handgunner practices under such conditions--but always with an unloaded gun. Effective defensive handgun practice and training should include using your firearm(s) under worst-case scenarios. This is most often addressed by including malfunction clearing, as well as drawing and firing from awkward or constrained positions. Less frequently, these same drills are done with just one hand--usually strong-hand only but also less-dominant-hand practice for those who are into intensive self-defense training. Very infrequently, if ever, do we experience using our handguns while our hands are, in effect, partially disabled such as when they're cold, wet, have dirt or mud on them, or when we're simply wearing gloves. All of these conditions reduce the ability to grip, manipulate and fire your handgun. These problems are surmountable, but it's best to experience them and fight through them--if not overcome them--when you don't have your life on the line. Yes, professionalism and plain old-fashioned guts can get you through, as they did FBI Special Agent Gordon G. McNeill as he related in comments he made to W. French Anderson, MD, the author of Forensic Analysis of the April 11, 1986 FBI Gunfight (paladin-press.com). This gunfight was the now-famous one that had FBI agents pitted against Michael L. Platt and William Matix when the agents attempted to arrest the two robbers and killers after stopping the car they were driving. During the four-minute-long gunfight after the car stop, Matix shot McNeill with a .223-chambered Mini-14 rifle, with one round hitting him in his right (shooting) hand. McNeill related his thoughts and actions after this wound in the interview with Dr. Anderson, "After firing four rounds I took a direct hit on my right hand from a .223 round," he said. Despite this, he fired two more rounds, which apparently hit Matix, taking him out of the fight. He said that after attempting to reload his revolver and being unsure if it was still working since blood and bone fragments from his hand were caught up in the cylinder, McNeill moved to his vehicle and grabbed a Remington 870 and shot at the robbers, who'd taken cover behind their vehicle. McNeill in effect skipped buckshot beneath the vehicle, hitting both suspects in their feet. McNeill was not sure if his revolver would work. He had the presence of mind not to dither over this but instead armed himself with another gun and stayed in the fight--and did so despite the severe wound to his hand. Rather than second-guess his actions, consider this: Others might not have the wherewithal to react and then take the action he did. This presence of mind comes from training, and while there's no way to simulate a wound such as McNeill sustained, you can practice having your hands wet, cold (weather permitting), gloved and so on. DO NOT use a loaded gun to work on this. By the very nature of the exercise, you almost assuredly will fumble the gun and may well drop it. You may not have muzzle control nor be able to keep from pressing the trigger, however inadvertently, and that can bring tragic results. Also, by not using a loaded gun you can be aggressive in trying various ways of operating and firing your pistol or revolver when your hands are handicapped. Remember, you are attempting to learn manipulation and your limitations in using your gun under such conditions. For starters, don't neglect loading and malfunction clearing drills. If, for example, you're wearing gloves, it's particularly easy to find yourself loading part of a glove along with a fresh magazine. The same type of problem occurs when retracting or releasing the slide, and interference from glove material may prevent you from fully opening or closing a revolver cylinder. A variation of this is trapping part of your glove beneath or behind the trigger. Yet another is gripping the gun too high, with or without gloves, where the web of your hand--naked or gloved--can stop the slide of your semiauto. The same is true if you're using a revolver. You might well take or move into too high a grip on the frame and then have the web of your naked or gloved hand block the hammer, keeping the gun from firing. An ancillary benefit to this exercise is learning the limitations of your chosen defensive handgun. For example, many swear by the 1911 pistol, as well as polymer pistols that have short trigger movements, and many want to have the lightest, most crisp trigger pull possible. 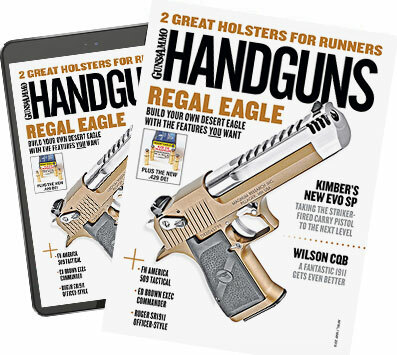 Well, when your fingers are covered with dirt, a glove or are numb, lightweight triggers become "no weight" triggers--assuming you can even get a finger in that condition into a small trigger guard. Also, you may find it advantageous to change action types with seasons. I like medium to large double-action revolvers in cold weather as I get more gun to grab and a heavy, long trigger pull. The long-stroke semiautos also become more attractive as conditions worsen, and one sees the wisdom of not having a light-breaking trigger on a defensive handgun. How often do you need to practice this dirty work? You're the only one who can answer this question, of course. You alone must decide if you have the skills necessary to be able to defend yourself in a real-world attack.